The team that brought the world “Hold On To Your Butts” is back. Recent Cutbacks returns to The Peoples Improv Theater with “Fly, You Fools!” Directed by Kristin Mccarthy Parker, produced by Allyson Morgan, and with foley and music by Blair Busbee and Kelsey Didion respectively, “Fly, You Fools!” will reunite Kyle Schaefer and Nick Abeel performing alongside Matt Zambrano. Not knowing what to expect when I first sat down to see their Jurassic Park inspired “Hold On To Your Butts”, I ended up leaving having experienced the best comedy show I’ve ever seen. I am entirely confident that they can do it again with their latest production. As I said in my review of the show, this is a rare, genuine talent and the kind of comedy that cannot be taught. I wholeheartedly reccomend that you all check them out immediately. Or when previews begin in March. 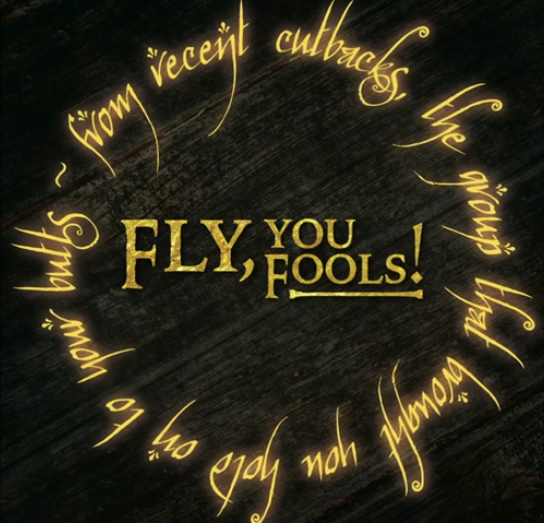 As a special treat for fans (and me), certain dates for “Fly, You Fools” will offer a double feature, with a performance of “Hold On To Your Butts” to take place afterwards. It is my opinion that most things in this world are always made better when you add a dash of Goldblum. In this case, a pair of glasses, some exposed chest hair, and plenty of bumbling, stuttering and yes, cackling, brings the essence of the ‘Blum to life in ‘Hold On To Your Butts’. I still believe this. And is anyone else hoping they return to The Pit to bring Nerd Goldblum to life with Independence Day? With the new movie coming out, the timing is perfect. Tickets go on sale February 29th, with previews beginning in March and performances taking place in April.